I tend to check at least one Wikipedia page per blog post. It’s a simple way to double-check the little pieces of information that make a post come together. I use Google more times a day than I’d ever care to count. Today, two of the most-visited sites on the Internet have gone black – one symbolically, the other quite literally – in the most publicized opposition to date of anti-piracy legislation SOPA and PIPA. Google knows you can’t live without it. That your life is inexorably intertwined with its products and services. 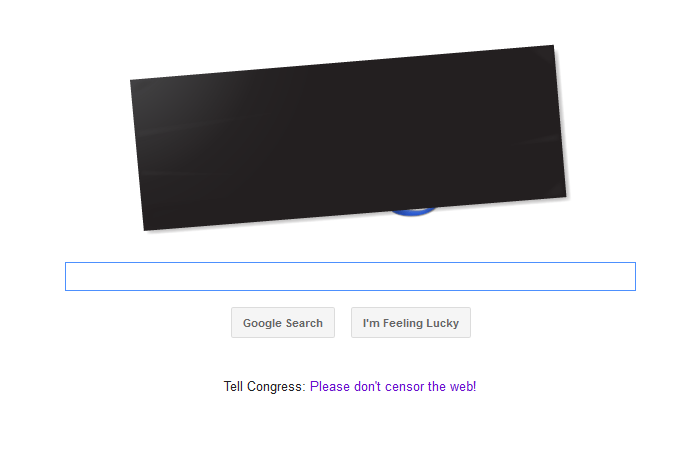 So, rather than a complete blackout, it’s going with a censor bar on its homepage. Others, perhaps most notably Reddit, dreamed up the initial idea of the blackout and participated today. Facebook and Twitter users are changing their profile pictures en masse to a variety of blacked-out or censor-barred avatars. Facebook CEO Mark Zuckerberg even Tweeted (yes, you read that right) for the first time since 2009. It’s all in response to a pair of bills making their way through Congress. SOPA, the Stop Online Piracy Act in the House of Representatives, and PIPA, the Protect Intellectual Property Act in the Senate, both began with the intention of cutting down on illegal sharing of copyrighted materials online. Both seek to accomplish this by increasing the power of government, and perhaps more importantly, private industry, to fight copyright infringement. The Draconian extents to which the proposed measures would allow lawsuits and shutdowns of infringers merit comparison with the prior restraint advocates of pre-Internet publication. But you can read about that at many other destinations. 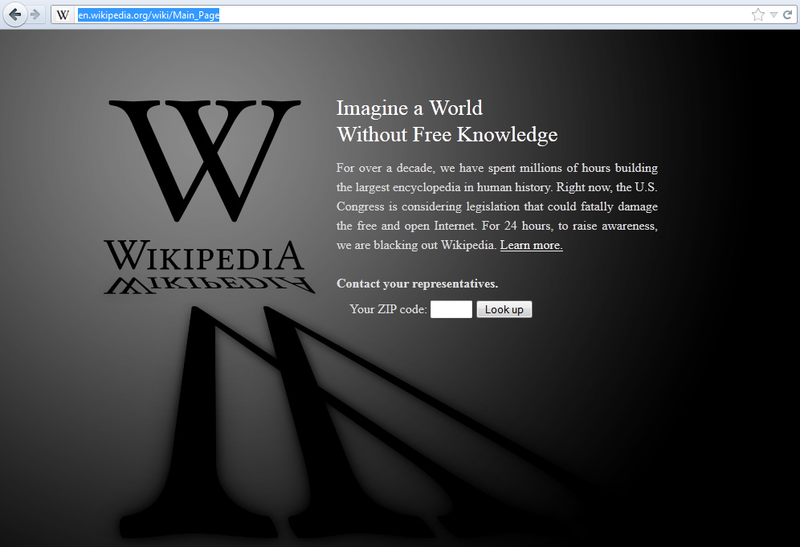 Public opposition to SOPA/PIPA was warranted, needed – but it had the wrong voice. Wikipedia added some credibility (when did you ever think you’d hear that? ), but when a mega-conglomerate like Google joined Jimmy Wales in his cause, that was a game-changer. Now, the entertainment industry was being battled by the business end of the Internet, not just the open-source crowd. As Internet titans jumped in, the news media followed. You couldn’t turn on a cable news channel today without hearing something about the issue. While I obviously haven’t done any sort of rigid content analysis (nor do I plan to), I would feel safe in arguing that the majority of that coverage has been sympathetic to the opposition. Twitter, Reddit, and tech blogs like Mashable are only going to carry the message so far, to target publics that, quite honestly, would probably be too small to create a threat to legislators. Today’s “mainstreaming” expanded the audience significantly, and the message has been presented in such a way that much of that audience still knows very little about SOPA or PIPA, but they know they don’t like it. For the Internet freedom crowd, that’s all that really matters at this point, because when we’re talking about Washington, D.C., perception is everything. Already supporters, and even a few co-sponsors of the bills, have withdrawn their support in response to the massive opposition. Congressional phone lines and websites have been flooded. The spirited few are acting; the masses are now aware and aligned against the legislation. In this electoral system, it’s the winning formula for the people to battle their representatives. At this point, Congress will move forward on each measure. It will take continued efforts over the next month (at least) to affirm to legislators just how risky a “yea” is to their reelection chances. But for now, I stand impressed at the power of the Web community after what will likely remain the opposition’s signature moment. ** As a side note, I am not suggesting that copyright infringement is not a problem. In fact, it’s one that affects my profession directly, although it’s less talked about than the stealing of music or movies. MSNBC.com’s Bob Sullivan has a must-read article today about blogs that rip-off the work of journalists, and even briefly touches on the aggregation practices of the Huffington Post and others that some in the industry consider a great threat to the success of online news outlets. Want to know more? Look it up on Wikipedia… tomorrow.